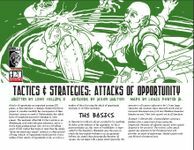 Attacks of opportunity are important in many d20 games, as they introduce a strategic element that forces players to consider carefully the consequences of their characters' actions in combat. Unfortunately, this added layer of complexity may prove daunting to some gamers. The mechanic often falls by the wayside as an afterthought, used only with great reluctance, and as a result, many gaming groups miss out on a rewarding aspect of d20 combat that makes it more than the simple "attack-hit-attack-miss-repeat" system it is often accused of being. Attacks of Opportunity should provide a basic outline of how attacks of opportunity work, as well as a number of ideas for using the attack of opportunity mechanic to its fullest potential. This 13-page PDF is an easy-to-integrate items and just the sort of thing needed for DMs to add depth to any great d20 fantasy campaign world and gaming session.